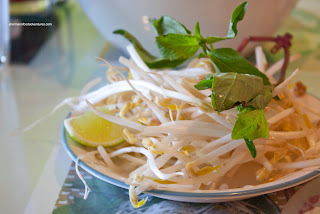 As for food, I went for the usual Special Pho or better known as the Pho Dac Biet. It was a reasonable portion with a decent amount of al dente noodles and tender meat. I found the broth to be on the lighter side. I didn't get much in the way of meat flavour; yet it was aromatic while leaning towards the sweeter side. At the very least, it didn't exhibit much MSG. A respectable bowl of Pho considering the location. Of course that wouldn't be the only thing I ate, so I also got a Cold Cut Banh Mi. This wasn't bad as well. The bread was crunchy and actually quite airy inside. As evidenced in the picture, there was no absence of meats and ingredients. I wouldn't say the flavours hit me with much force; but it was still a very satisfying sandwich considering that this is not a Banh Mi joint. 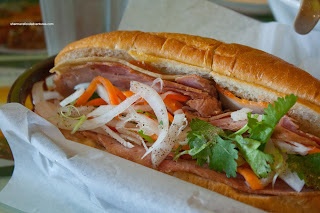 Furthermore, there is not much in the way of Banh Mi on the Westside period. So that brings us back to my original point. Since there as many Vietnamese restaurants as one can count on 2 hands on the Westside, Pho Gizmo does the trick. Of course there are better; yet not close by. I do have to note that the service was quite good and at one point, was "served" by the kid (with help from the mom of course). We're quite close to Gizmo. 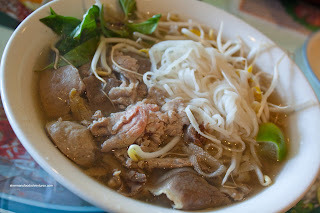 Yet I'd rather drive out to Kingsway/Fraser area for my pho/banh mi/bun kicks. Having said that, Gizmo has stuck around for a few years now, so kudos to them. @LR Yup, I would agree with you on both points.